Make buttermilk syrup and let it cool in the fridge (can be done even a few days in advance). Recipe below. Buy peaches at your local farmers’ market. 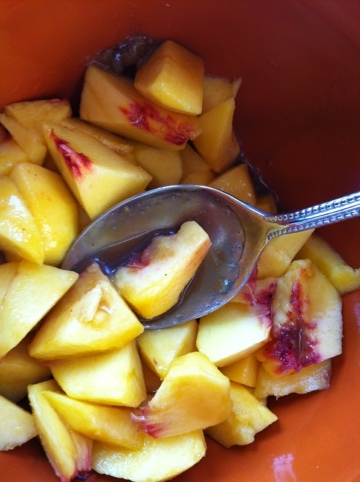 Wash, peel, and slice peaches. Drizzle peaches with buttermilk syrup. Cook in a large pot (it bubbles up!) Keep stirring for 7-10 minutes at boiling temperature. Now, make sure you boil it long enough. The first time I made this, I didn’t boil it long enough and it was too runny.